In shallow glass baking dish or resealable food storage plastic bag, combine Worcestershire sauce, oil, pepper and garlic; mix well. Add steaks; turn to coat. Cover dish or seal bag; refrigerate at least 30 minutes to marinate. In large bowl, combine 1 cup of the flour and beer; mix with wire whisk until smooth. Cover; refrigerate 30 minutes. When ready to grill, remove steaks from marinade; reserve marinade. Place steaks on gas grill over medium heat or on charcoal grill 4 to 6 inches from medium coals. Cook 12 to 18 minutes or until of desired doneness, turning and brushing once or twice with marinade. Discard any remaining marinade. 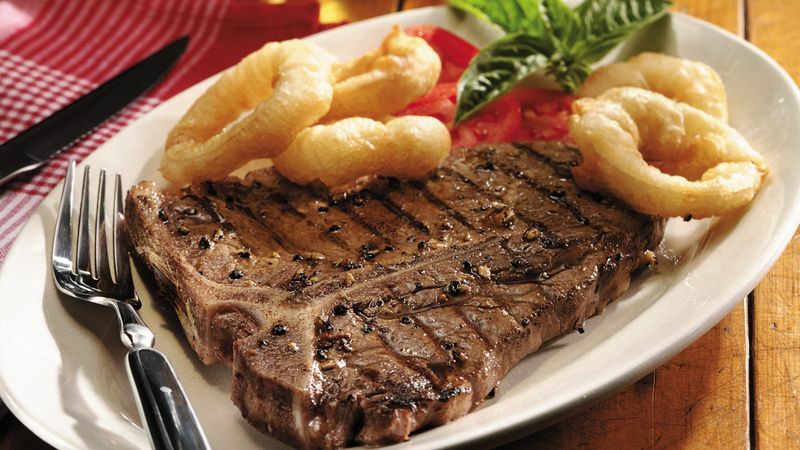 Serve several onion rings on top of each steak. To broil steaks, place on broiler pan; broil 4 to 6 inches from heat using times above as a guide, turning and brushing once or twice with marinade.